What is this? Warm snow? It's all relative, of course, because snow at 32 degrees Fahrenheit (0 degrees Celsius) begins melting to water. Snow is usually below its melting point temperature, and even much below. This changes the way things slide on it, including a pair of skis. The nature of the air when and where snow forms and how long since it fell from the sky as well as what happened to it since--makes a difference in sliding, too, for all these factors affect the nature of the snow crystal. Snow is like rain in that molecules of H-2-O separate from other parts of the air and, becoming heavier than their surroundings, start a fall to Earth. Thus snow initially takes the temperature of the air of its birthplace (although the process of it crystallization may warm the air of its origin a bit) and is modified as it falls to earth through air that may be of other temperatures and moistures. When it lands on the ground or snowpack it may be further modified by the temperatures of things there. Then it is subject to daily variations of air temperature and also to warming by sun or cooling by wind, and is also affected by whether it landed or was blown into a sunny or shady or windy spot as well as its vertical position in the snowpack; i.e., how deeply it got buried. The snow crystals have different forms depending on the conditions at their birth and their subsequent history. Air that is less moist generates one kind of crystal and wetter air another, with many variations between. Each is composed of an individual array of rods, columns, dendrites, and other intricate forms, but all arrayed in a hexagonal fashion so that fingers or rays emanating from a central point will always have six arms (unless one is subsequently knocked off). The old adage that "No two snow crystals are alike" may or may not be true when the number of snowflakes that have fallen in the Earth's (and other planet's) long history is considered, but it does illustrate the point that the crystals vary and that the way things slide on the different types might vary, too. On the way to earth, the original snowflakes may be modified by banging into each other, glomming onto others to make clumps an inch or more in size (this occurs in wetter snowfalls), and they may be blown about having their delicacies knocked off to create more tiny particles. All these processes make the snow denser than it was at birth, and depending on how it has been affected the accumulated snow will have differing densities. Whereas water has been assigned a density of 1.00, snow may have a density as low as 0.03 (3 percent water, 97 percent air). This is the stuff you see expert skiers wallowing in in in ski films; it is so light that when snowplows try to move it off the road, it just swirls up around the truck and settles back on the road behind them If the snow stays cold, it may be blown about, losing more of its projections, and the molecules at the ends of the snow crystals also will migrate to the crystal centers, or to other crystals, too, both processes making the snow become denser all the time. Skiers and boarders, too, can cut the snowpack, releasing air and compacting it with their weight as well as the melting/refreezing that happens when sliders pass over the crystals. A convention is that snowpacks are about 10% water (density of 0.10) or about 1 inch for each foot of depth before melting begins, although this can of course vary. Thus a snowpack that is 10 feet deep will yield about 10 inches of water when it melts. And when a ski area reports a foot of new snow and therefore probably good powder skiing, depending on conditions at the time of its forming this foot result in only an inch or less of snow ultimately added to the pack. If cold enough, about 15 degrees Fahrenheit, snow squeaks when walked upon. Remember Moh's Sclale of Hardness for different substances, where diamond is a 10, glass about 7, steel about 6, a penny about 3, and talc just 1? Although odd to consider snow as hard, snow is a form of ice, and ice has a hardness of 1.5 near its melting temperature. At lower temperatures, ice gets dramatically harder, reaching 7 at minus forty degrees Fahrenheit. Walking on snow of less than 15 degrees Fahrenheit crunches the grains together and they squeak, just as quartz sand does when it is walked on. Cold flying snow can thus abrade softer objects such as tree trunks and can sting when it hits flesh. And require different types of wax depending on how cold and how hard the snow is. Snow that is wet can create a suction on skis, slowing them. 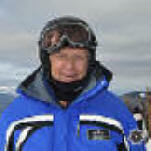 For insights on skiing warm, wet snow, see Skiing "Spring Snow". Skiing in snow that is dry and cold is explored in Skiing Powder Snow. Very early in the history of skiing this difference in ski sliding was discovered, depending on the snow's temperature and texture. At first resins from trees were spread on ski bases to help them slide, then lacquers, electricians' tape, and finally the bases were made of slick plastic. Still the skis sometimes did not slide well enough, especially for racers who knew their times depended not only on their skill but also on how well their skis slid. And so through the span of time, waxes were developed to help the skis slide better. But it was also found that some waxes made the skis slide worse, depending on snow conditions. Thus waxes were formulated differently for different conditions. Oversimplifying, waxes that work well in warmer and wetter snow conditions are softer, by convention usually colored yellow, gray, or black. Waxes that work well in cold and dry snow condition are harder, by convention usually colored green. Waxes for intermediate conditions are usually colored blue and red. Red waxes are often a good choice for an all-around "universal" wax, although some universal waxes are clear (but clear paraffin is also a good wax for warm and wet conditions). Manufacturers provide charts that index their waxes to snow temperatures and types and it is probably wise to hone in on one brand and get used to its performance characteristics. Swix, Homenkohl, and Toko are some brand names. But why wax in the first place? Maybe you don't want your skis to go faster. Waxing also helps us turn our skis more easily and reduces their tendency to slow or stall should we press them a bit too much. Anyway it is good if the skis tend to perform much the same each time we go out so we have less to adjust tactically, and the waxes help achieve this. Waxing helps us ski efficiently, using the skis' design to turn us. For insights on how to apply wax, see Ski Equipment. A final word: Eventually, after selecting the tactic to apply, you must "Point the skis down the hill; let them buck; the mountain will teach you!" Skiing Cold Snow-Warm Snow/New Snow-Old Snow--you are on this page. This "Skiing Cold/Snow/Warm Snow" page last modified 11/03/2017 07:21:37 AM. Did you come here from a link on another website? For latest version of this page, copy to your browser: http://www.SkiMyBest.com/skicold.htm. Copyright © 2013, 2014, 2015, 2016, 2017, 2018, 2019. William R Jones.